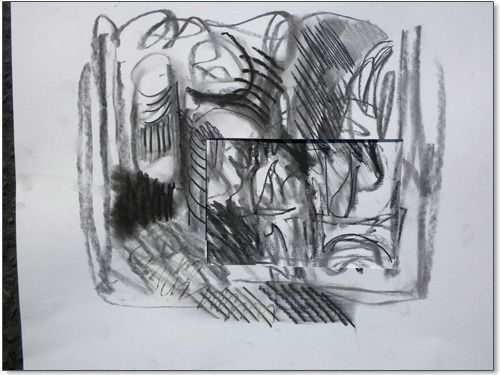 Charcoal Doodles II: Draw, Cut & Place! 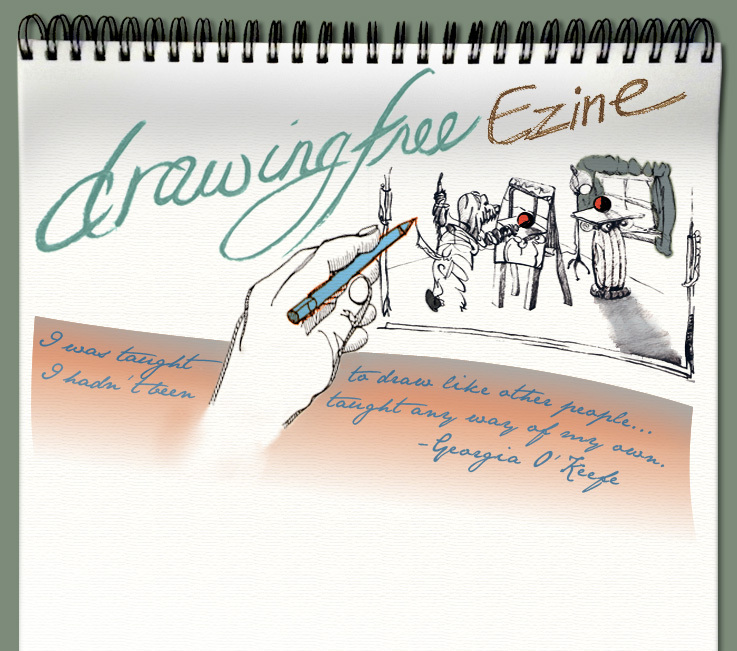 1.Starting HERE with the remaining drawing from DrawingFree Ezine #9. In DrawingFree Ezine #9 this postcard size piece was cut from the original drawing. I have placed a new piece of the same Bristol paper UNDER the first drawing. I like looking at this empty white window in the drawing. Instead of using the SAME paper as before you could use a different paper. 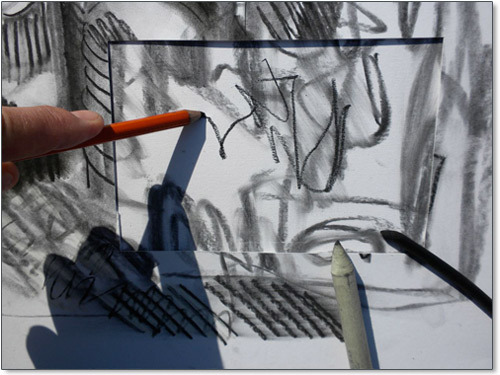 You could even use a black piece of paper, for instance, and then draw with white chalk as well. 2.Now I start drawing on the new paper (from behind) with more vine charcoal. I draw in a squiggly way. You could draw any way you want and with any other media you want. 3.I then placed the new paper with the "squiggly thing" drawing back behind the original drawing. 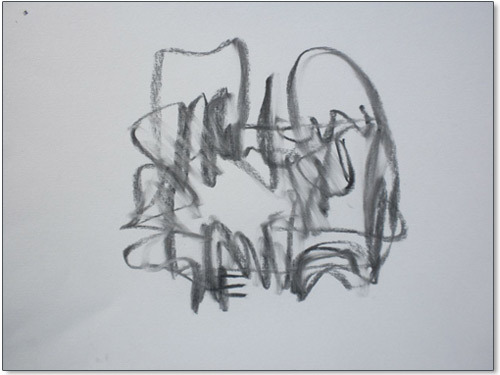 The "squiggly thing" drawing is purposely LARGER than the window in the original drawing. Making the new drawing BIGGER makes it easy to find a position for the new drawing that looks and feels best. When the new paper with the new drawing is behind the original drawing then look and contemplate and adjust it for the best visual fit. You can usually feel it in your body when the position of the new drawing feels like it is the best placement. It grabs you and feels a bit more exciting. 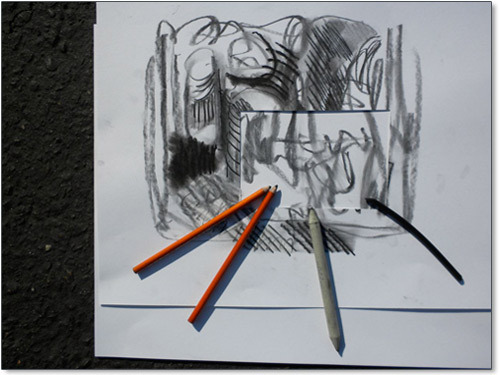 4.Charcoal pencils, stump to blend with and a piece of vine charcoal. I'll use these to further develop the new squiggly drawing that will fit in behind the window of the old drawing. Start to draw on the new little drawing while it is placed where it will be behind the larger drawing. 5.Adding more drawing to the little drawing. 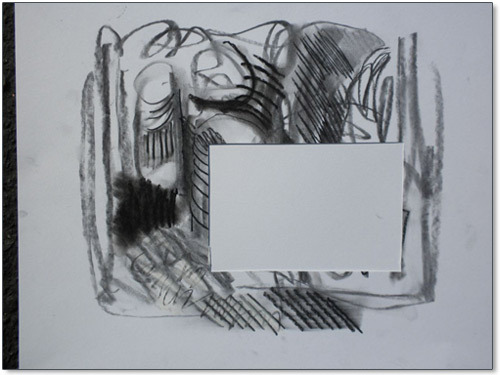 The charcoal pencil is darker and a different texture than the existing vine charcoal squiggly drawing. 6. After drawing for a bit on the little drawing with it in the window, take it out and draw on it WITHOUT the window of the big drawing. It will be easier to continue and thus "complete" lines past where the window would be. This allows you draw freely on your new paper without your drawing being confined and thus harder to draw on when it is behind the larger drawing. Your lines and smudges won't end abruptly or in a non-natural way as they might if you would have to run into or had to allow for the edge of the window. On the other hand, you COULD make a big obvious deal about one or more of the edges of the window! Your choice! 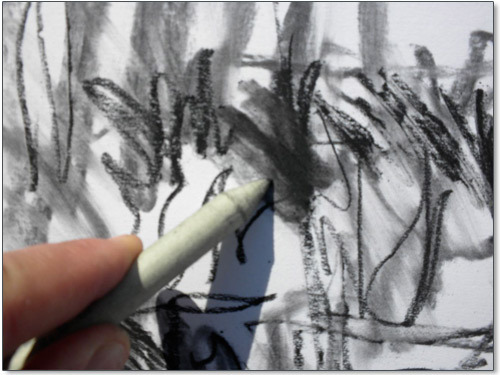 7.The smudge stick or STUMP is blending the charcoal into the paper. The stump can be used to actually make new marks with any charcoal that may have built up on the stump. 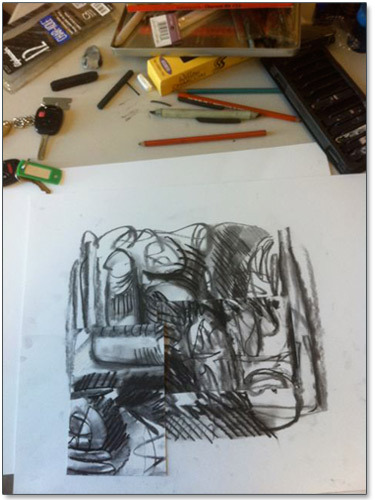 Here the stump is grabbing and using excess charcoal that may lay above the marks on the paper to make new marks in new ways. Experiment! 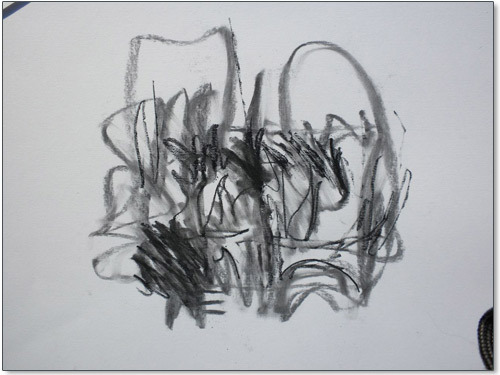 8.My new little drawing looks like this after adding in some marks with the charcoal pencils and working it with the stump. I have decided that it is ready now to go back UNDER the original drawing. 9.This is what it looks like when it is placed back under the original drawing. 10.You might notice that I am holding the paper steady in the sunlight in the parking lot by my studio -- with my foot! -- while I draw and take the picture at the same time. I am begining to work the design of the OUTER (original) drawing with the design of the INNER (new) drawing. I'm using vine charcoal with an end shaped into more of a point and adding some pressure to get a darker line that would be easier to pull up or smudge out if I needed to. The vine charcoal is softer and easier to erase, smudge or smear out than the compressed charcoal or the charcoal pencils (also compressed). You can "sharpen" vine charcoal or any pastel, nupastel or conte by rubbing it on sand paper and shaping it into the form you want. 11.Now I am drawing more in order to visually integrate the outer drawing with the inner drawing by working on the INNER drawing that is showing thru the window in the original. 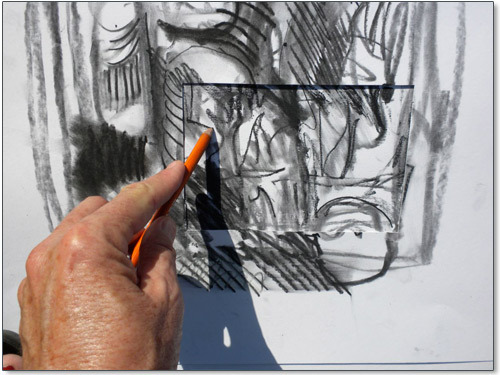 I can also work both at the same time -- crossing from one to the other -- drawing across the cut edge of the window. 12.Close-up of working the two designs across the edge of the window. 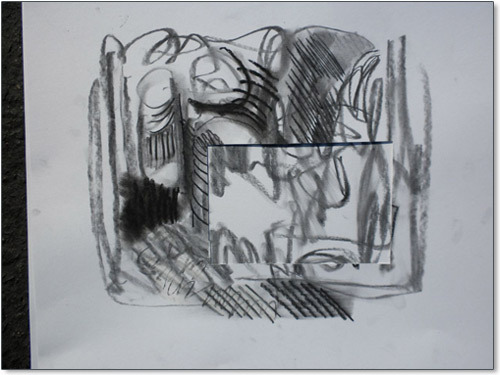 Work to make the two drawings "work" together. They do not have to "match up" everywhere. I'm really pushing hard on this charcoal pencil. Notice how some of the charcoal of the pencil even breaks off the pencil and lays on the paper. Resist the urge to blow excess charcoal off your paper. 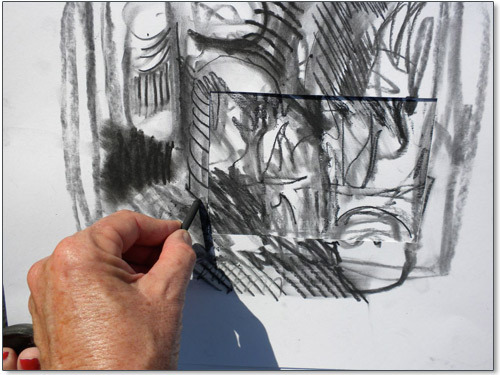 Either use the excess charcoal to make more value in the drawing OR (when it becomes possible) raise the drawing up and let the excess fall off onto a piece of "catch" paper that you have between your drawing and your table. You can give the paper some thumps or some quick jabs of the lower edge of the paper to the "catch" paper on the table to get the loose charcoal to fall off. Then do the same with the "catch" paper and get the excess charcoal into the trash. Keeping your work area relatively clean in not necessary but it can make life easier. Copyright 2011 Margaret Welty. All Rights Reserved. Permission is granted to link to this site, information or to quote WITH author notation: "From the DrawingFree Ezine Created by Margaret Welty at www.drawingfree.com". 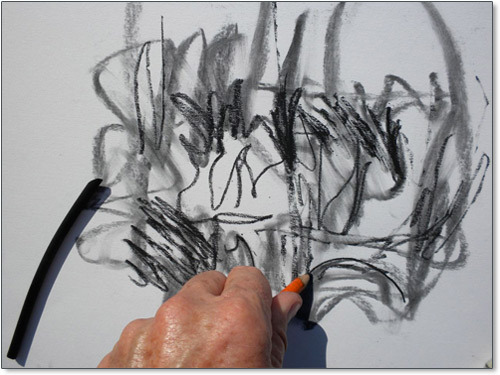 Each lesson presented in the DrawingFree Ezine gives you ways to massage your own neurological white matter to further form and train your ever transitioning ART BRAIN. Remember that the key is to DRAW, play and be easy with yourself. Eliminate any unrealistic expectations and judgements about your work. Work to be happy while you draw! Draw like a child with no expectations beyond your current beginner's brain, eyes, hands and heart. Orient your focus toward the fascination that consumes a small child upon discovering that she can make her own marks appear. Make your own marks appear! !